Last year, McDonald’s test-marketed a Big Mac in Ohio. The special sauce was blended with sriracha, that now-ubiquitous condiment consisting primarily of red chili paste and vinegar, whose origins have been traced to Thailand (specifically the subdistrict of Sriracha in Chonburi Province). 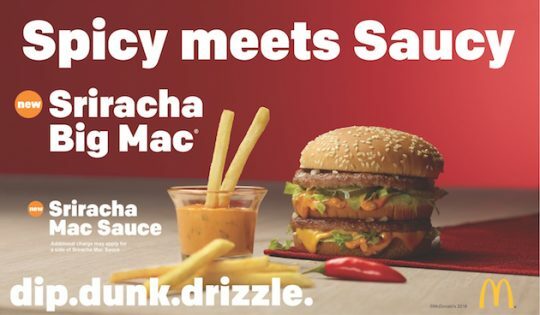 This year the Golden Arches went nationwide with its Signature Sriracha 1/4 lb. Burger, Signature Sriracha Buttermilk Crispy Chicken Sandwich, and Signature Sriracha Artisan Chicken Sandwich. My immediate concern: Does McDonald’s really expect customers to order these sandwiches by name? It’s literally and figuratively a mouthful. For all the money spent on marketing strategy, did no one ponder this? Compare "Hi, I’d like the Signature Sriracha Buttermilk Crispy Chicken Sandwich" to "Hi, I’d like the McRib." On a deeper level, this also means the sriracha moment is now over. And it’s been over for a while. Remember when sriracha was Bon Appétit’s Ingredient of the Year? The year was 2009. The condiment is now about as exotic as chipotle. It’s ready to join the ranks of pesto and ramps. There are gradations in chili powders and curries that an American used to buying Heinz and McCormick off the shelf would never have imagined. "Dry hottest chili" says a packet of weeds the color of molten lava. "Ground Hottest Chili Sauce" says a jar; the elixir inside is quite green. "Sriracha Chili Sauce," in a tall-neck bottle, is a beautiful bright orange. But sriracha’s relatively mild heat is a plus—because you can blend it into pretty much anything—cocktails, as a snack flavoring, even in ice cream. Huy Fong Foods, the biggest producer of sriracha in the United States, does about $60 million in sales and ships to 27 countries. Heinz and Tabasco are making their own versions. And now it’s at McDonald’s, in a Mac Sauce, and for dipping Chicken McNuggets. I’ve sampled the sriracha burger, with its baby greens, crispy onion, and white cheddar. It was fine. But it felt oddly small for a quarter-pound of beef. And it wasn’t salty and greasy as I’d come to expect. I tend to agree with Washington Post food writer Tim Carman who said, "it reeks of a corporate attempt to capitalize on two of the biggest food trends of the past decade (although far after each has peaked). It’s the fast-food equivalent of watching Dad sport rompers and pledge his undying love for Drake." Aside from sriracha, the other trend Carman references is kale, which is also newly available at McD’s. So if sriracha is passé, what’s next? In that same food section as Carmen’s column, on the front-page below the fold, was an article with the headline, "It’s time for harissa to be a staple in U.S. pantries." Which means sometime around 2020 someone at a McDonald’s will be ordering a Signature Harissa Buttermilk Crispy Chicken Sandwich. This entry was posted in Culture and tagged McDonald's. Bookmark the permalink.